This is fascinating! I'd never heard of Oil Pulling before but it kinda makes sense. What do you think? Here is the article from UndergroundHealthReporter.com. I'd love to hear if you have tried this. What in the world is oil pulling? Oil pulling is the practice of taking 1 tablespoon of a cold-pressed vegetable oil (such as sesame or sunflower seed oil) and swishing it in your mouth for about 15-20 minutes. This is done soon after waking, before eating or brushing one's teeth -- and it has the effect of "pulling" bacteria, parasites, mucous and other toxins from your body through your saliva. Oil pulling has its roots in Ayurveda, the Hindu art of healing, which asserts that the tongue is mapped by organ-locations. This means that each section of the tongue is connected to, or corresponds to, the liver, heart, kidneys, lungs, spleen, pancreas, small intestines, stomach, colon, and spine. When you swish the oil around the tongue, you effectively soothe and stimulate the key meridians of the body, and their corresponding organs. In his book, Perfect Health, Deepak Chopra, an American physician born in India, a bestselling author and lecturer on Ayurveda, spirituality and mind-body medicine, cites oil pulling as an Ayurvedic technique that is "valuable for purifying and strengthening the body." Oil pulling gained popularity in recent years partly because a Ukrainian doctor, Dr. F. Karach, who reportedly cured his own chronic blood disease and 15-year-old arthritis through oil pulling, made the world aware of this unusual therapy.
. Dr. Karach claims that oil pulling totally heals "headaches, bronchitis, tooth pain, thrombosis, eczema, ulcers and diseases of stomach, intestines, heart, blood, kidney, liver, lungs and women's diseases. It heals diseases of nerves, paralysis, and encephalitis. It prevents the growth of malignant tumors, cuts and heals them. Chronic sleeplessness is cured." Dr. Karach even challenged a conference of Ukrainian cancer specialists to try the process in the treatment of cancer. 1) Immediately upon waking up in the morning, before brushing your teeth, eating or drinking, put 1 tablespoon of either cold-pressed sesame oil or sunflower seed oil in your mouth. 2) Tilt your chin up and slowly swish the oil around your tongue, pulling and sucking it through the teeth, making sure you don't swallow the oil. Do this for 15 to 20 minutes until the oil in your mouth becomes a thin, white foam. You can check your progress periodically -- if the oil is still yellow, continue swishing. Do not gargle the oil. Just swish it in your mouth. 3) When the oil turns white, spit it out, then rinse the remaining oil out of your mouth. 4) Drink 1 - 3 glasses of water. For maximum detoxification, some people do this procedure 2 more times during the day -- always on an empty stomach, or 4 hours after meals. I thought you might like some inexpensive and very effective ways to combat this common problem. You know I'm a big proponent of nutrition - "you are what you eat". However, we all need a little extra help, especially if we've spent years eating less-than-wonderful food. So WATER and VEGETABLES and FRUIT are your biggest friends when it comes to fighting cellulite. Get lots of all three. Whenever you feel hungry or tired, reach for water first then fruit or vegetables. There is no need to ever go hungry. Fill up on as much as you want of these three and watch the pounds and the cellulite melt away. Meanwhile - jump-start the new you with a luxurious Herbal Bath . Simply follow the directions on the bottle and either wrap the problem areas or pour the solution into a nice hot bath and relax for an hour. You deserve it! You'll be amazed at how soft your skin feels afterward. Even more exciting will be the inches you can lose with every treatment. 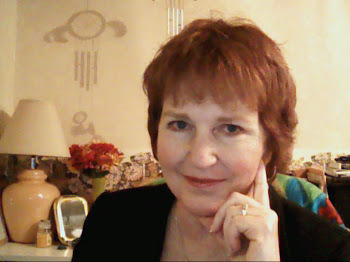 (see my other blog on the Herbal Body Wrap). Then I make a mixture of sugar and olive oil or coconut oil. Keep it dry in a jar by the tub and rub it into dry skin before you shower. You will LOVE how your skin feels. Be sure to spend some time rubbing it into your cuticles on your fingers and toes as well as any rough spots on your feet. You can even use very gently on your face - feels great and you'll positively glow! Here are some other easy and effective remedies for cellulite. Please share you results. 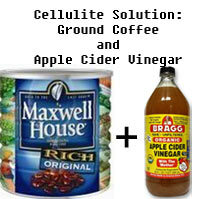 "Ever thought of rubbing ground coffee and apple cider vinegar on your cellulite spots? Well, this is my secret remedy. First I use ground coffee. I dampen my skin, rub coffee grounds in an upward motion on my cellulite areas, massage and rinse. Then, I use apple cider vinegar. Just pour the vinegar in a bowl, soak hands in it, and massage onto skin. I know it sounds strange, but I have found it to work." "Pure essential oils are great and healthy for your skin. 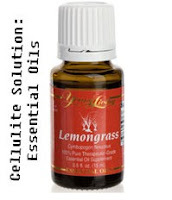 There are several oils that aid in cellulite reduction. Lemongrass and grapefruit oils are both wonderful oils that help reduce the appearance of cellulite. You apply it topically up to twice a day and watch the cellulite melt away!! Beware of buying imitation products, that say they are "all natural" oils, because they can contain a high amount of olive oil or water. I recommend Young Living products, as they adhere to European Standards. By using essential oils I have visibly reduced the appearance of cellulite, naturally, and without irritation to the skin and cells. It is always best to take a natural approach wherever possible! "